When you look in the mirror, are you happy with your smile? If you see changes that you’d like to make but feel unsure about the long treatment times of orthodontics, we have a solution for you. Smilefast was developed by orthodontists who wanted to offer a more affordable and quick treatment for their patients. Available at Anthony Spink Dental Suite, Smilefast’s smart technology can help you love the way you look. With efficient movements and advanced technology, you’ll be incredibly satisfied with your results. When you have your first consultation with us, we’ll detail exactly what you can expect from treatment. We’ll use digital models of your teeth to diagnose your problem, plan each stage of treatment and show you what you can expect afterwards. A process called indirect bonding is used to place the brackets on your teeth. This precise method will put each bracket in exactly the necessary place. The precision of the Smilefast system is what creates shorter treatment times. In total, you’ll wear your orthodontics for 6-9 months. The Smilefast technology is revolutionary and exclusive to this system. It’s also what allows you to check your progress over time. 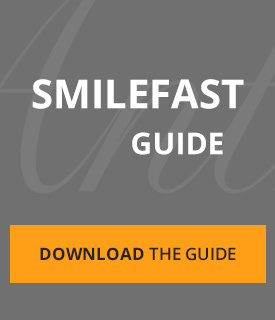 Unlike traditional braces, Smilefast boasts quick treatment times. Not only is this convenient for you, but it also means a more affordable price tag. Since you won’t need to wear your braces for as long, you won’t be paying as much as you would with metal braces that are worn for one or two years. If the braces aren’t metal, what material is used? Smilefast utilises ceramic brackets that are tooth-coloured. You get the same effects as powerful traditional braces but without the unsightly metal involved. How long will I have to wear the braces? With Smilefast, most people complete their treatment in 6-9 months. Traditional braces take 12-24, on average. Smilefast is designed for the needs of adults rather than focusing on teenagers. If your teen is interested in an alternative to metal braces, we’ll discuss options with you. Is Smilefast uncomfortable to wear? You may notice a new sensation right after you have your brackets placed. It will subside as you become used to how the braces feel, within a couple of days. How will I know whether I’ll be happy with the treatment outcomes? Smilefast’s state-of-the-art approach to orthodontics includes using advanced software to show you what you can expect when treatment is completed. You’ll be able to see the changes that are made with your teeth before you even decide to begin. Will I see you for periodic checkups? Yes. Though we don’t want to inconvenience your schedule, it’s essential that we check and make sure the proper movements are happening with your teeth. These appointments will be quick and will only be booked when necessary. Are you interested in Smilefast Brighton? Contact Anthony Spink Dental Suite today to discuss if you’re a candidate!